Russian TEM18-017, photographed on the outskirts of Moscow on December 7, 2004. Photo by Oleg Kotov (source: www.commons.wikimedia.org). TEM18V-001 in the RZhD livery, photographed on January 13, 2011, probably at the manufacturer’s premises. Photo by Transmashholding (via www.commons.wikimedia.org). The sole Polish TEM18-296, photographed in Sławków on January 17, 2015, shortly after withdrawal. Photo by Krzysztof Malinowski (www.gigabyt.cal.pl – used by permission). Soviet/Russian TEM2 heavy switcher remained in production at Bryansk and Voroshilovgrad (now Lugansk) from 1960 to 2000, about 10,000 examples being built. Basic design of this locomotive, developed from wartime ALCO RSD-1, was progressively modified. Between 1991 and 1992 three extensively redesigned versions were built by BMZ of Bryansk, designated TEM16, TEM17 and TEM18. They differed mainly in the prime mover used (6D49, 1-PD4 and 1-PD4A diesel engines, respectively). Only two TEM16s and one TEM17 were completed and TEM18 was finally selected for production, which commenced in 1992. Although externally similar to its predecessor, TEM18 is a new design, albeit featuring the same general layout. 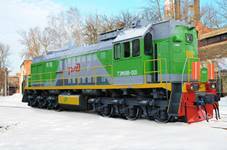 Apart from diesel engine, new trucks were used, adopted from TE109 line locomotive. Initial variant remained in production until 2012 and total output was 470 examples (according to some sources, 464). Next version, TEM18D, featured improved 1-PD4D diesel engine, rheostatic brakes and other minor improvements; it was built solely for Russian state railways RZhD (PЖД), 219 examples being delivered between 2004 and 2008. The same operator received also 39 examples of TEM18V, fitted with Wärtsilä W6L20LA power units of the same rating (1200 hp). TEM18DM is a development of TEM18D with the same diesel engine, but redesigned cab and many minor improvements; deliveries commenced in 2007 and this type still remains in production, with 1063 examples built until June 2017. TEM18G is an experimental version with engine running alternatively on diesel fuel and liquid natural gas; only two were built, one in 1997 and one in 1998. In 2006 two examples of the TEM18EG tropicalized version for export to Guinea were built. Their ultimate fate is unknown. Other modifications include TEM18T (electrodynamic brakes), TEM18A (featuring easy conversion to 1435 mm track) and TEM18UT (microprocessor transmission control system). 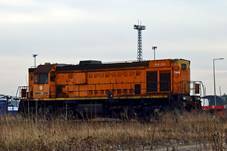 In 2006 Centrala Zaopatrzenia Hutnictwa (a company involved in provisions of raw materials and products to metallurgical industry) purchased a brand-new TEM18-296, for use at the Sławków terminal station of the LHS, a broad-gauge line running from Ukrainian border to Upper Silesia. The sole locomotive of this type in Poland, it remained in use for a comparatively short time. In 2015 it was withdrawn and sold, allegedly to the Ukrainian division of Russian RUSAL metallurgical concern. Instead of being transferred to Ukraine, however, it underwent an overhaul at the Daugavpils repair works in Latvia and in November 2017 was dispatched to an unspecified African country (Guinea?). Further details are lacking. In 2007 LHS, which is a PKP subsidiary, revealed an intention to purchase six TEM18s, but the idea was soon abandoned. *) Apart from production, data refer to the TEM18 version.